As one of the world’s largest complete game room manufacturers, American Heritage Billiards began in a small suburb outside of Cleveland, Ohio. They started manufacturing pool tables in 1987 from scratch using the best American woods and precision machinery. They rose to immediate success due to the level of craftsmanship they offered in their products. They have changed and grown a lot over the years but they still remain true to their founding principles: help friends and families gather more often. Since the American Heritage company has been around for about 30 years, they expanded from making their handcrafted billiard tables into a company that makes all game room furniture and products. This expansion into other markets like home bars, bar stools, air hockey and foosball tables has been a great growth area for them. 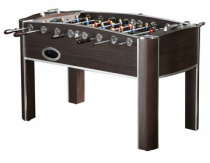 Their products are American made and they follow a rigorous construction standard on their game room products. Their craftsmen offer woodworking that is second to none when it comes to American furniture quality. 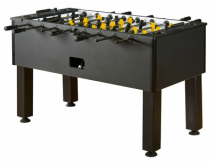 They currently manufacture 6 different foosball table models. A few of these tables are intended to blend in with your man cave as they are designed to have a wood furniture appeal. The Element and Seville models even offer a rustic look that is really coming back into popularity in modern design and architecture. 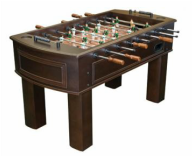 The Tourney has more of a game table look that most of the tables have on the market today.